Greta Gerwig, usually disappoints me - as an actress and now in her writing and directorial debut, LADY BIRD, a coming-of-age film about a seventeen-year-old girl growing up in Sacramento “…the Midwest of California…” (the best line in the film,) and the love/hate relationship she has with her working-class family and peers. 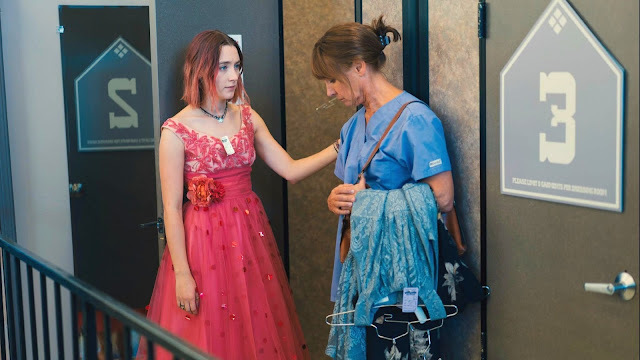 Social distinctions figure prominently in Gerwig’s cinematic world of “ironic class strivers.” I keep wondering why I am left cold by her words and her characters and eventually understood that LADY BIRD is too self-consciously trying to be inclusive - inclusive of every contemporary issue - touching upon a diversity of characters and situations with momentary episodic flashes.The touch is light, illustrating concerns rather than delving into them, giving us tokenism - glossing over deep pain and longing with a CliffsNotes diminution. Saoirse Ronan is excellent as Christine "Lady Bird" McPherson - a nickname she gives herself to appear distinctive. I am sympathetic to the aspirations of a young, self-involved teenager searching for a path to glamour and excitement. Youth is an innocent time - one open to endless fantasies - reality has not yet penetrated the hermetic world of dreams. The “firsts” of the teen years - first kiss, first sexual experience leading to the loss of virginity, first self-awareness of one’s own ethical and moral values, and the critical realization that the world is not always spinning for you alone - solely for your personal gratification. The film opens with Lady Bird and her mother - a wonderful performance by Laurie Metcalf - who is driving and listening to Steinbeck’s Grapes of Wrath on audio tape - both simultaneously weeping, moved by the beauty of the spoken words; their mirrored responses reflect their enduring affection. And suddenly the mood is shattered and we see the other side of their relationship - a mother who works double shifts as a psychiatric nurse to supplement the family income so that her daughter can go to a private Catholic school; the burden of monetary expenses weighs heavily on her shoulders. The ever-present resentment that comes with sacrifice is often unleashed on her oblivious daughter in a torrent of sarcasm, humiliation, and disparagement. Greta Gerwig is at her best in the scenes between mother/father and daughter. A lovely tenderness exists which is often choked and stifled by the exigencies of financial straits.The underpinnings are there for a truly fine movie, but in the rush to cast a wide net, Gerwig compromises her subjects’ humanity, placing a veil of bromides over what could have been profound interactions. Maybe next time. I hope so. I didn't expect to like this movie at all, but in the end I did. Saoirse Ronan gave a fine performance as a wallflower at a Catholic high school who insists on being called "Lady Bird". Besides being unconventional, she is emotionally immature but intelligent. The plot centers on her efforts to get into an East Coast college despite her mother's disapproval. She does. At her first party in New York she reinvents herself by calling herself by her real name and changing the city she is from from Sacramento to San Francisco. I didn't empathize with the character but thought she was well-drawn.